An array of California home owners say that OneWest Bank, under the leadership of Treasury Secretary nominee Steven Mnuchin, actively steered them away from making timely mortgage payments to qualify for federal loan assistance that never came. It's an allegation OneWest denies. The accusations center around a government program called HAMP -- Home Affordable Modification Program -- launched at the height of the financial crisis in 2009. Under that program, borrowers could be eligible for new, lower payments and the banks that took part would also receive government incentive payments. But borrowers interviewed by CNN say that rarely, if ever, happened. Nicholas and Eloise Palumbo, who live in northern California, say a OneWest representative told them over the phone that to qualify, they would have to deliberately miss three months of mortgage payments. They acknowledge that they didn't manage their money well and got in over their heads when their payments ballooned. As a result, they needed their payments to be reduced urgently. "They told us that the only way we can make the modification is we didn't pay for two or three months," said Eloise Palumbo, who goes by the nickname "Lou." She says she didn't question the alleged instruction at the time because "knowing that we needed to do something to save our home, we did." Then the Palumbos receieved two separate letters from OneWest's loan modification office, both sent on the very same day, but with very different messages. Dated December 31st, 2012, one letter advised the Palumbos that their loan modification request was still being reviewed by the bank.The other letter told them their home had already been sold at a foreclosure sale. Not long after, the Palumbos say, a woman knocked on their door and told them she represented the person who had bought their home. "She basically wanted to introduce herself and see if she could look at the home for the person who bought it," Lou told CNN. "Then she showed us some paperwork from an auction." A source who was familiar with OneWest's foreclosure procedures at the time tells CNN that mistakes, and miscommunications, were commonplace. "They (OneWest) hired people who didn't know what they were doing and some bad information was being given out," the source told CNN on condition of anonymity. Other OneWest customers say similar things happened to them. Leron Lee and his wife Vicqui met in Japan when he was playing professional baseball. They say they were making timely mortgage payments for their home near Sacramento when their payments suddenly skyrocketed because of mortgage adjustments. "We were paying like $3,000 something a month. Comfortably. And then in the end of 2007, the next statement showed $8,700 something, a nearly $9,000 house payment." They say when they asked for help, they too were told by OneWest over the phone to miss payments to qualify for a new, lower, payment plan under HAMP. They took that advice and one result was their credit score plummeted. "One credit card closed on me and then everybody else followed," says Vicqui Lee. Ultimately, the Lee's declared bankruptcy, hired an attorney and four years later, saved their home by settling their lawsuit against OneWest. In all, seven OneWest borrowers told CNN similar stories. And Senate Democrats are holding hearings in Washington to highlight the stories of others who say they were victims of OneWest foreclosure practices. No witnesses aside from Steven Mnuchin will be allowed to testify before the Senate Finance Committee for his confirmation hearing on Thursday. CNN reached out for comment to Steven Mnuchin but neither he nor his transition spokesman would agree to an on camera interview. "Literally every major financial institution involved in the mortgage business was accused of the same thing. That's why there was an independent foreclosure review, which OneWest was the only major bank to complete. The findings of the review showed an exemplary record and an extremely low error rate. 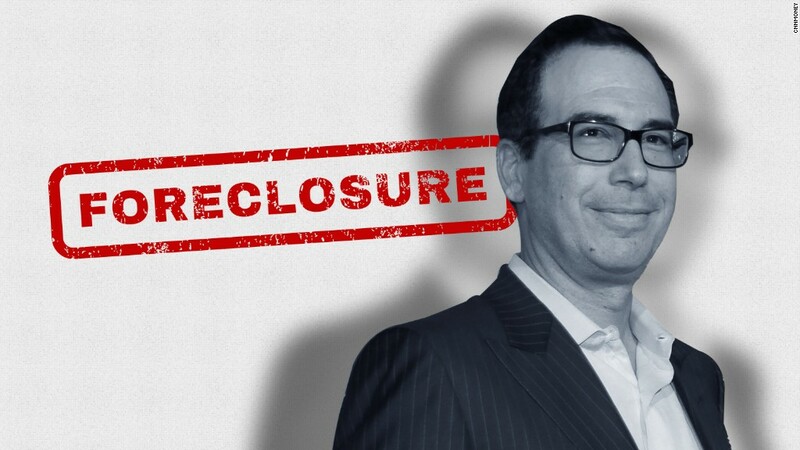 Steven Mnuchin expects to discuss his successful record of modifying thousands of mortgages, saving people's homes and jobs, at his hearing." A Treasury Department spokesman told CNN that under the HAMP program, there is no requirement that mandates missing mortgage payments for three months, yet numerous major banks have been accused of using similar tactics. Treasury also says that OneWest and its successor, CIT Group, were paid $413 million for taking part in that HAMP program. CIT Group bought OneWest Bank in 2015 for $3.4 billion. The company told CNN since the purchase, CIT "complies with all applicable laws and regulations" and that it has "implemented enhancements that strengthen the overall operations and controls at OneWest bank."